Return of an old guy! Forums » Introductions » Return of an old guy! Greetings guys! Sly Monkey here coming back from long term hibernation and ready to play the game again! With playing the game again means..yes...MORE ROLEPLAY!!! I'm super pumped about RP and can't wait to get in it but first! Let me introduce you to my main squeeze this go around! This is Ander Darkhaven! Dominion soldier and friend of most! As a soldier and is sworn to follow the orders of the dominion. But, new planet new opportunities, while he can stay in the military he can branch out into any other jobs as in being a bodyguard, working with mercenaries. Anything with punching really! As a person he is very formal and polite, he will never treat you with any indecency as long as you treat him such in kind, if you disrespect him, he will return it to you in kind. Later in the week I will make a formal character sheet for Ander so you guys can have a more in depth view of his life and history but until that happen I hope to see you all out in the Nexus! Feel free to message me via Discord or here..or the game if you want to role play or meet up for roleplay! Howdy there, Dominion scum friend! 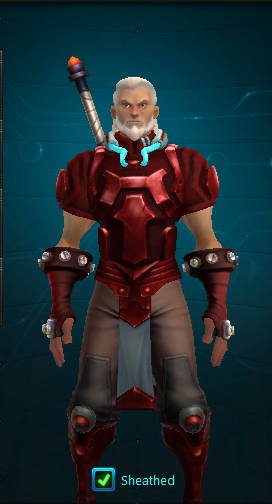 So glad to see you've made your way back to WildStar! Lovin' your guy's name - and the outfit is killer, too! Looking forward to any potential RP we might have in the future!